Global companies face unprecedented third party risk in today’s landscape. 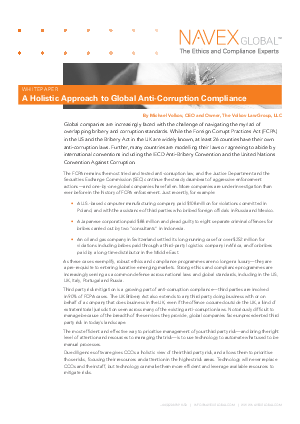 Not only are third parties involved in 90% of Foreign Corrupt Practices Act (FCPA) cases, the UK Bribery Act also extends to any third party doing business with or on behalf of a company, even if the offence occurred outside the UK— a kind of extraterritorial jurisdiction seen across many of the existing anti-corruption laws. Enter your information to access the full whitepaper now.